Paint is like make-up for your home so let’s talk about what looks good and what sells. Sure, pastels are great if you live in a Victorian but otherwise, I advise against pastels. Your home should blend in with the landscape so neutrals and earth tones are your best bet, especially for resale. Consider any other materials on your home before picking a paint color. The stone or brick play a key role when picking a paint color. Pick something that blends with those materials without too much contrast. It will look more cohesive if the colors all come from the same “color family.” If you have a lighter brick color with beige tones think about an off-white trim color versus stark white. You can always make a statement with color by painting the front door a bright color. The door doesn’t have to be the same color as the shutters as long as it is in the same color family. Sometimes people pick colors based on what they like instead of what compliments their home. I love the color orange. It stands for energy and a positive outlook on life, which is great. However, I would never paint my house orange. I want the energy for my home to come from the electrical box, not from the paint color. By all means, get help picking out a paint color if you don’t have a clue what would look good. Ask a friend, maybe a gay friend, or your paint expert at the local paint store. Get samples and try them out on your home but if you can’t decide after several samples, get help! Remember, paint isn’t permanent so picking out a color shouldn’t be stressful. Enjoy the process of making your home look the best it can look. 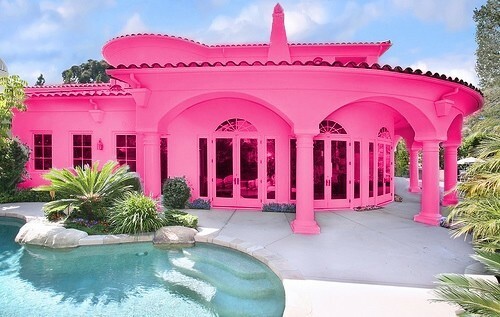 Stay away from pastels, and unless you have first-hand knowledge that Barbie is looking for her next dream home in your neighborhood, do not paint your home pink.